TX-2B / RX / 2B Â 5 channel radio remote control. This article is about a simple 5 channel radio remote control circuit based on ICs TX-2B and RX-2B from Silan Semiconductors. TX-2B / RX-2B is a remote encoder decoder pair that can be used for remote control applications. TX-2B / RX-2B has five channels, wide operating voltage range (from 1.5V to 5V), low stand by current (around 10uA), low operating current (2mA), auto power off function and requires few external components. The TX-2B / RX-2B was originally designed for remote toy car applications, but they can be used for any kind of remote switching application. Remote encoder / transmitter circuit. The TX-2B forms the main part of the circuit. Push button switches S1 to S5 are used for activating (ON/OFF) the corresponding O/P channels in the receiver / decoder circuit. These push button switches are interfaced to the built-in latch circuitry of the TX-2B. Resistor R7 sets the frequency of the TX-2Bâ€™s internal oscillator. Resistor R1 and Zener diode D1 forms a simple Zener regulator circuit for providing the IC with 3V from the 9V main supply. C2 is the filter capacitor while C1 is a noise by-pass capacitor. D2 is the power on indicator LED while R6 limits the current through the same LED. S1 is the ON/OFF switch. The encoded control signal will be available at pin 8 of the IC. The encoded signal available at pin 8 is without carrier frequency. This signal is fed to the next stage of the circuit which is a radio transmitter. Crystal X1 sets the oscillator frequency of the transmitter section. R2 is the biasing resistor for Q1 while R3 limits the collector current of Q1. The encoded signal is coupled to the collector of Q1 through C3 for modulation. Transistor Q2 and associated components provide further amplification to the modulated signal. Remote receiver / decoder circuit. The remote receiver circuit is built around the IC RX-2B. The first part of the circuit is a radio receiver built around transistor Q1. The received signal is demodulated and fed to pin 14 of the IC. Pin 14 is the input of the built in inverter inside the IC. R2 sets the frequency of the ICâ€™s internal oscillator. O/P 1 to O/5 are the output pins that are activated corresponding to the push buttons S1 to S5. Zener diode D1 and resistor R12 forms an elementary Zener regulator for supplying the RX-2B with 3V from the 9V main supply. C12 is the filter capacitor while R11 is the current limiter for the radio receiver section. Diode D2 protects the circuit from accidental polarity reversals. C15 is another filter capacitor and C14 is a noise by-pass capacitor. This circuit can be assembled on a vero board or a PCB. 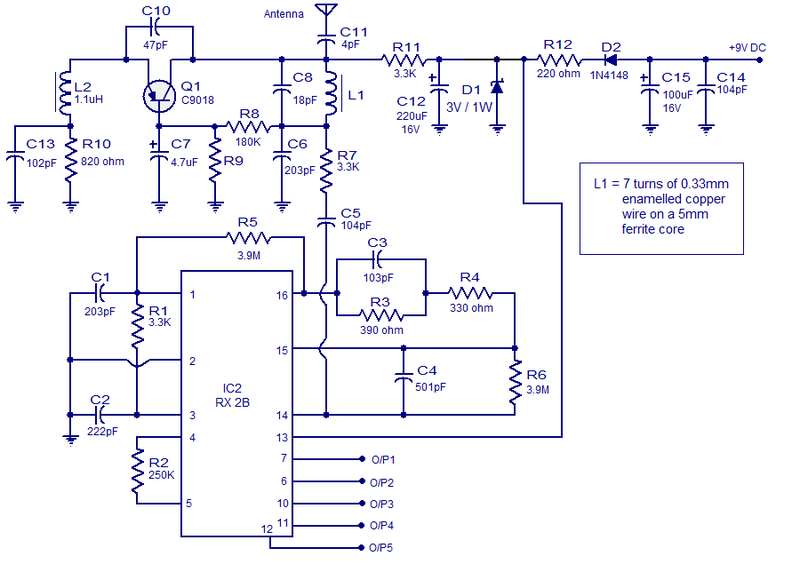 Use 9V DC for powering the transmitter / receiver circuits. Battery is the better option for powering the transmitter / receiver circuit. If you are using a DC power supply circuit, it must be well regulated and free from any sort of noise. Both ICs must be mounted on holders. Interfacing relay to the RX-2B output. 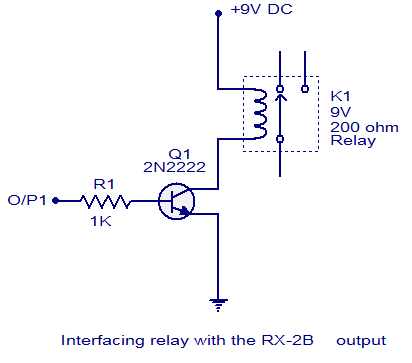 The method for interfacing a relay to the output of RX-2B is shown below. When push button switch S1 of the transmitter circuit is pressed, pin O/P1 (pin 7 of the RX-2B) goes high. This makes the transistor 2N2222 to conduct and the relay is activated. The same technique can be applied to other output pins of the RX-2B. The relay used here is a 200 ohm type and at 9V supply voltage the load current will be 45mA which is fine for 2N2222 whose maximum possible collector current is 900mA. When using relays of other ratings this point has to be remembered and do not use a relay that consumes a current more than the maximum possible collector current of the driver transistor. What do I need to change on the receiver to change from 27Mhz to another frequency? Hi and thanks for this useful website..
if someone can help me for that it will be great for me. One more quick question, what size antenna should i use for the remote control? Where I connect the dc motor???? And what will be its range (in metre)? Here in transmitter and receiver circuits, what does ground(GND) actually means to be? the negative terminal or the earthing? Please help me sir to understand it. Can you see there is none connected 13 terminals in encoder/transmitter circuit. those are the Grounds. You must connect all of these together and finally to the negative of the battery. negative terminal of an electrical voltage source. all 5 channel works simultaneously or not?? at a time only one channel can carry the signal??? or at a time all channels can carry the on/off signal??? then can I fed different different PWM to input of transmitter simultaneously?? and can I get different different PWM on corresponding channels at receiver simultaneously ?? Only one channel at a time will work. Its range is also limited to inside a room only. and all channels can carry the signal like PWM and not only ON/OFF signal. as well as range should be wide…..
Five meters, but you could extend the range using power amplifier. Sir please can i use this circuit for my aircraft? If yes then how. Thank you. No this cannot be used as there is no analog output, no proportional control activity can be carried out, only binary output is available with this remote. Pls help me….output of rx2b is analog or digital??? It is on/off digital output. 5 channel indicates five independent binary output to control 5 independent on/off functions. The output is either zero volts or a positive voltage, such as 5 volts. The 5 volts will turn on a transistor relay driver. Hi Seetharamen, i built the circuit of RX in my protoboard. But i realized that the 1N4148 doesn’t have any voltage, and the rest of the circuit also doesn’t have. Now, do you know if the 1N4148 have the function of open and close the circuit? The chip RX-2B only will run when Tx-2b run togheter? may specify the full part number of IC1 and IC2 please? Are we use “O/P” signal on the L293D Ä±nput leg? Thank you in advance. My doubt is how I crank the engine that my car with the circuit of RX? We have two engines to crank. How I make it? If you want to crank two together use one output with a relay’s two NO (normally open contacts) contacts. Hi Seetharaman, just so u know i had another question on that 2km transmitter posted since last friday. OK, but i wouldn’t rather use relay. I saw on the datasheet of Silan, this circuit have been actived by transistor. Can I use these? Please, help me! 1) Sir you said it’s 5 channel remote control but how can i connect the motors? 2) and how can i control the motors? 3) and sir the value of R9 is missing. Thank you. It is just with high low output only you have to use proper interfaces to drive motor on/off forward/ reverse etc. analog control of speed is not possible (slow fast etc). R9 is 100 K ohms 1/4 watt see earlier detailed comments. I want try it. but, how built part of coil L2, L3, L4 both side RX and TX? Then, what name of IC’s type? i want try it, but how i can get all componen from thats circuit. i need it. This is a nice circuit and thanks for sharing. however, value of R9 is missing. could you please let us know it. what is the range for the transmitter and receiver in this circuit? and value of R9? IF any one has a good experience of this circuit, and please tel us that, how for could this remote works? if i can attach big antenna, can i use this for @ least 100 meters? thanx if any one can answer. Hi Xavier please go through earlier comment before raising a question. please see my comment of 15th july 2013.
they are available ebay, with free shipping. I just ordered a pair of tx2b and rx2b, just for 2.45 usd. i want similer ic of TX-2B & RX-2B this 2 ic not goted in market. how can i get latch output from RX2B directly??? if i can’t get latch output directly which method can i get latch output?????? pls how the safty of that circuit ? can it work from another transmitter of by a random signal? what is the operating frequency of that transmitter and receiver ? what is the value of resistor R9 ??????????? what is the value of resistor R9…? what is the operating frequency of that transmitter and receiver and what is the maximum distance they can handle ? but give Little Idea regarding Antenna….. Above is the website datasheet of the 5-function remote controller RX-2B and TX-2B.I have an important question: In the typical application RF Circuit transmitter and receiver, they show a High pass filter CAPACITOR in the receiver that connect to pin 3(SI)which is the input pin of the encoding signal of RX-2B and a RESISTOR with a zener diode. I would like to know what is the value of the CAPACITOR and the RESISTOR in the receiver? can u please tell me the value of coil l 3 in “5 channel radio remote control ” in henry …. – what can be the maximum possible distance between transmitter and reciever? – are these circuits already assembled and where to buy? i found this IC in a remote control car.the brand of the toy is TOPSPEED. to interface other circuit to it you must use relay. will u pls give me the ic number forreciever and transmitter circuit. specifyas many alternative ic number aspossible for both the circuits. will u pls give me the ic number for reciever and transmitter circuit. specify as many alternative ic number as possible for both the circuits. is it necessary to connect interfacing relay circuit to the rx-2b or it will do with out it. its urgent please reply me as fast as possible.